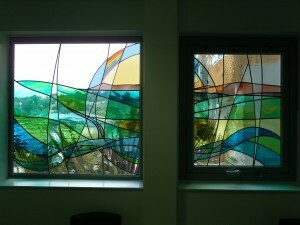 The image shows a new window recently installed in the new Prayer Room at the Northern General Hospital in Sheffield. This window was commissioned following a relocation of the original space and the brief was to create a window that would encouage peaceful contemplation and calm for all users of the room. The idea is based on a nearby Peak District landscape and the idea of the circle of life. To encourage meditation the window contains images of life in all elements; salmon in the water, birds in the sky and the grasses of the local landscape. They are not immediately obvious to the eye, they are more revealed on closer examination.